Light Up Skull Lantern.Includes: Plastic lantern with creepy skull accent. Skull eyes light up and change color from red, green and blue right before your eyes.Dimensions: 13" Long x 8" Wide. *Requires 2 AA Batteries - Not Included.Spook your friends with this awesome Light Up Skull Lantern! 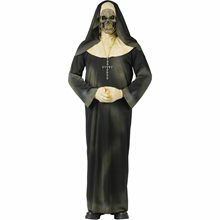 Sure to catch everyone's eye this Halloween! 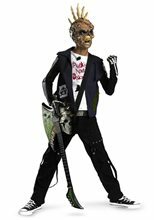 Skeleton Pirate Child Costume.Includes: Skull mask with hat and braided hair pieces, vest/shirt and skeleton gloves.Available Size: Child - Medium (8-10), Child - Large (12-14). 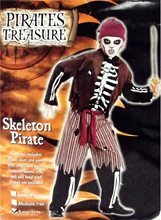 *Sword, Pants and Shoes Not Included.Boy's Skeleton Pirate Costume includes skull mask with hat and braided hair pieces, vest/shirt and skeleton gloves. 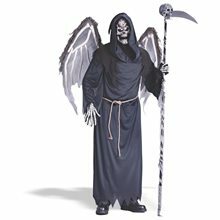 It's a great scary Halloween costume for kids. Sword not included. Comes in two child sizes - medium and large.